BASF Guest Blog: Calling All Wheat Growers: Monarchs Need Your Help! Over the past 20 years, monarch butterfly populations have declined more than 80 percent. The decline is due to many different factors: deforestation of their overwintering site, severe weather events, availability of nectar sources and loss of milkweed habitat. By simply preserving and re-establishing milkweed habitat on non-crop areas of your farm, you can play an important role in protecting this iconic species. Contrary to popular belief, not all weeds are bad. In fact, native milkweed, typically found growing in non-production areas of your farm such as ditches, roadsides and fence rows, is one such weed. Monarchs depend on milkweed (Asclepias genus) as a place to lay their eggs and it is the only food source for monarch larvae. As a wheat grower, you are particularly well positioned to help be a part of restoring the monarch population. Many of the states with the greatest number of wheat acres fall along the monarch’s migration path and prime summer breeding range. Is your farm located in this migration and breeding range? If it is, then it’s not too late to start thinking about what you can do this fall and next spring to provide habitat for the monarch butterfly. Some of the key questions to ask yourself can be quite simple or may require a little bit of additional research. What areas of your farm could be refuges for monarchs? What species of milkweed are native to your area? Which native nectar plants can you establish that provide the necessary fuel for the adult monarchs? Around farms there are a variety of locations that can be perfect monarch refuges. Attributes of ideal locations are full sun and places that are not actively managed or disturbed. Buffer areas near streams and other waterways can provide an ideal location to plant milkweed. 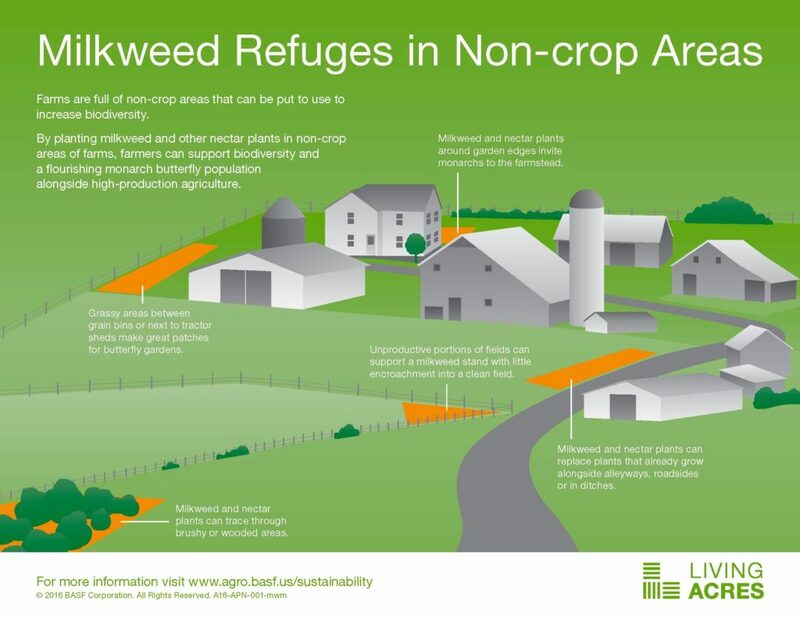 Roadsides, alleys, and fence rows are also areas of farms where establishing milkweed will not interfere with your farming operation. When it comes to selecting the types of milkweed to establish, always plant milkweed that is native to your state – you should avoid planting non-native species. Just like the choices you have when selecting the right wheat for your farm, you also want to select the best type of milkweed that will thrive in the soil conditions where it will be planted. Do you have heavy or light soil? Is it well drained or poorly drained? While milkweed is the essential larval habitat, nectar sources are also critical for the adult monarchs. Again, we recommend finding and planting native forb species that flower at different times from spring to fall to provide the nectar source for the migrating or breeding adult monarchs. Preparing the site for seeding is essential – the Missouri NRCS office has provided a step by step process to prepare a seed bed. Check with your local NRCS office to see if they have something similar that is specific to your state. To help take the guess work out of the process of identifying native milkweed and nectaring species, visit www.monarchmilkweedhabitat.com to understand what’s native in your state with links directly to the USDA NRCS Plants Database where you’ll find plant fact sheets, pictures and native ranges for each species. We invite you to sign up for the #MonarchChallenge newsletter to get additional information on milkweed management, and to have the opportunity to receive free milkweed seedlings next spring. To learn more, please visit www.monarchchallenge.com. Tens of millions of farmland acres lie across the monarch’s migration path. That’s why you, and farmers just like you, are in a unique position to play a key role in helping maintain and restore the monarch population. It’s not too late to make sure your land is a monarch-friendly one! Living Acres created the #MonarchChallenge, a research-based program that targets farmers and farming communities to proactively preserve and cultivate milkweed in non-crop areas of their land. Milkweed is an important part of the monarch butterfly’s life cycle, as it’s the only weed monarch caterpillars will eat. With a more than 80 percent decrease in the monarch population over the last few decades, there is a continued need to plant milkweed habitats along the monarch migration path. To learn more, visit www.monarchchallenge.com.